Two 100-megawatt hydrogen fuel power plants will be installed in the southern city of Gwangju in South Korea as a state-sponsored campaign to promote clean energy to reduce pollutant emissions. The Gwangju Metropolitan City announced Tuesday it will invest 1.4 trillion won ($1.2 billion) to build two 100-megawatt hydrogen fuel cell generating units, which would be the largest of its kind in Korea, in the southwestern city by 2022. 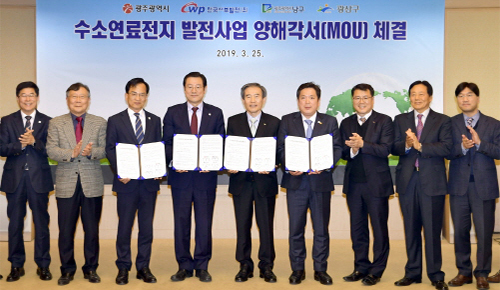 The city government signed a memorandum of understanding with state-run Korea Western Power Co. and two Gwangju districts - Nam-gu and Gwangsan-gu to build 100-megawatt hydrogen fuel cell electricity generator each in the respective districts. Each power plant building project is worth 716.0 billion won. The two fuel-cell power plants will generate combined 1,576-gigawatt hours of electricity per year enough to cover 18 percent of Gwangju city’s annual electricity demand. Under the agreement, Gwangju Metropolitan City will oversee the overall project while Korea Western Power will be responsible for engineering, procurement, and construction of the two fuel cell power generators. The power plants will be built on either within an industrial park or idle sites owned by the state in Nam-gu and Gwangsan-gu districts. The parties plan to select the sites within this year to start construction early next year. Under the plan, the two fuel cell power generators will be built by 2022. The city government estimates the new power generators will create nearly 6,300 jobs for construction and operation in the region. Also, the state gives special funding – one-off support of 10 billion won and 800 billion won annually – to the area where hydrogen fuel-cell power plants will be built for the welfare of the region. Hydrogen fuel-cell power plants are emerging as eco-friendly alternatives to coal-fired power plants as it emits one-eighth of carbon dioxide and no sulfur oxides and nitrogen oxide. The Korean government is actively promoting the so-called hydrogen economy in hopes of reducing fine dust and greenhouse gas emissions that have recently emerged as a major health threat in the country. The government also expects the hydrogen economy would provide new growth momentum for the local automotive industry that is one of the country’s pillar industries. It earlier this year set a target to ramp up local annual production of hydrogen fuel-cell electric vehicles to 100,000 units in six years from current fewer than 2,000 units.